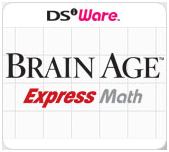 The logo of Brain Age Express: Math. Brain Age Express: Math (Known as A Little Bit of... Dr. Kawashima's Brain Training: Maths Edition in the PAL region) is one of three DSiWare installments in the Brain Age series, released as a launch title in December 2008 in Japan, and in April 2009 in North America. All Nintendo DSi XL systems have this game and Brain Age Express: Arts & Letters pre-installed. Train your brain with this downloadable, math-focused edition of the popular Brain Age series. This page was last edited on 8 October 2016, at 00:34.